Enterprise repositories comprise numerous business process models either created by in-house domain experts or external business analysts. To enable a widespread use of these process models, high model quality (e.g., soundness) as well as a sufficient level of granularity are crucial. Moreover, they shall reflect the actual business processes properly. Existing modeling guidelines target at creating correct and sound process models, whereas there is only little work dealing with cognitive issues influencing model creation by process designers. 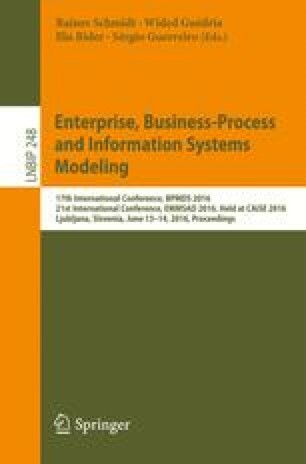 This paper addresses this gap and presents a controlled experiment investigating the construal level theory in the context of process modeling. In particular, we investigate the influence the social distance of a process designer to the modeled domain has on the creation of process models. For this purpose, we adopt and apply a gamification approach, which enables us to show significant differences between low and high social distance with respect to the quality, granularity, and structure of the created process models. The results obtained give insights into how enterprises shall compose teams for creating and evolving process models.